How Much Do We Actually Love Coffee? Imagine the dread of waking up and not being able to enjoy a cup of freshly brewed coffee. If you agree with me, then you will probably love today’s post. I am going to teach you how to make coffee without a coffee maker. So, the next time you don’t have access to your coffee machine (or your favorite coffee shop), you will still be able to enjoy your delicious beverage. See, I got you covered! 54% of adults in the US drink coffee every day. On average, people drink around 3 cups a day. 79% of US citizens prefer making coffee at home. 65% of people drink coffee with breakfast, while only 5% have it with other meals and 30% drink coffee in between meals. 35% of coffee lovers prefer taking their beverage black. 60% of people claim that absolutely cannot start their day without a cup of coffee. Americans drink around 280 million cups of coffee every day. There are more than 21,000 coffee shops in the country. 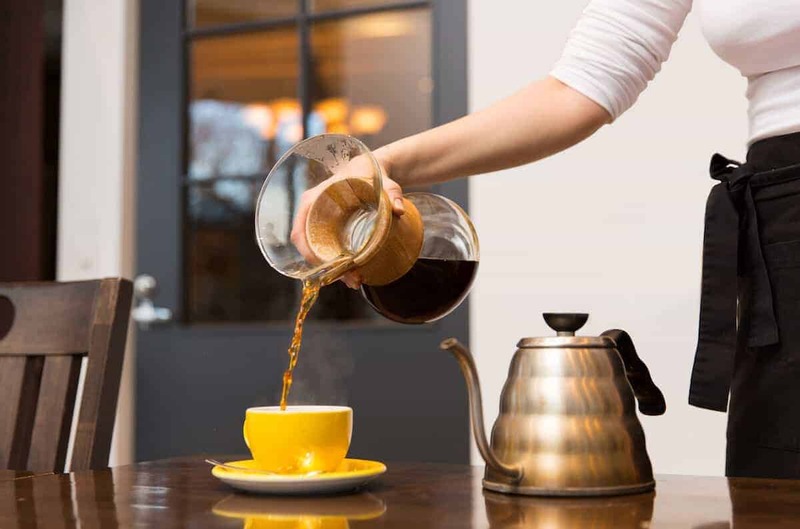 If you are one of those people who cannot imagine their life without this flavorful beverage, learning how to make coffee without a coffee maker would definitely come in handy! The roast type also determines the caffeine amount in coffee beans. Dark roasts tend to be weaker since caffeine gets “burned off” during the roasting process. So, the longer you roast the beans, the less caffeine they will contain. Measure the needed amount of water for your desired coffee strength. I personally prefer 3 parts water and 1 part coffee since such a ratio provides me with the most balanced taste (to my liking): strong but not too bitter. Place your ground coffee into a mug. Boil the water and pour it over your coffee. Let it sit for a couple of minutes (4-6 would be enough). During this time, your coffee will brew, and the coffee grounds will go down to the bottom of the mug. You can drink your beverage now since the grounds are on the bottom. Just make sure you stop drinking when you reach them. If you want to, you can strain your coffee. Just take another mug, place a small sieve on top of it, and run your beverage through the strainer. It will catch the coffee grounds, and your drink will be “clear” and smooth. If you take your coffee with cream, milk, or sugar, it’s still a good idea to taste it before adding anything to it. Why? Because only by taking a sip of black coffee, you will know what it actually tastes like and how much of a sweetener or creamer it requires. When you brew coffee without a coffee machine, you can mimic the French press brewing process. Simply cover your mug with a small plate or a lid. This way, your beverage will have a bit richer taste and flavor. You can prepare beforehand for the days when you don’t have your regular access to coffee. For instance, when you know that you will be spending the night at a friend’s house who doesn’t own a coffee machine (or even any coffee grounds, for that matter) or when traveling, you can use special coffee cubes. There are different brands available, but they all offer the same thing: fresh coffee in a form of a cube that you need to put in a mug and add hot water. And boom — you have your beverage. No effort, no time wasted. Take your coffee filter and put it on top of the mug. Secure the ends of the filter around the mug rims using paper clips or binders. Place your ground coffee into a filter. Boil the water and pour it over the grounds. Don’t be in a hurry and pour the water bit by bit so that it would have enough time to go through the filter. Stir the coffee grounds after each water portion. Once the water has seeped through your filter, you can remove the paper clips (carefully!) and take the filter out. There you have your flavorful DIY cup of coffee! Even when you are not using a coffee maker, you still need freshly roasted and high-quality coffee beans. You see, there’s a direct correlation between your beverage taste and the beans you’re using. So, give your preference to freshly roasted ones. When the beans aren’t fresh, they lose their flavor and you end up with a mediocre, dull-tasting cup of coffee. To make the process a bit easier, you can use a short string to tie the coffee filter. Just make sure that your string isn’t covered with wax (it will melt right into your cup). Simply place your grounds in it and tie the ends (so that it would mimic the tea bag). Place your coffee bag into a mug and pour some hot water in. Let it steep for a few minutes, take the bag out, throw it away. Enjoy your coffee. For the best tasting coffee, you don’t actually need boiling water. You need its temperature to be between 195 and 205 F. Of course, no one has the time (or desire) to carry around a cooking thermometer to determine the water temperature. What you can do, however, is boil your water in a kettle and then leave it to cool down for around a minute. The temperature will decrease a bit and will be more favorable for the coffee brewing process. If you don’t have a coffee filter, you can use a clean cloth, a handkerchief, a cheesecloth, or a paper towel (if it’s thick enough) instead. Place your ground coffee into the French press. Boil some water and let it sit for around a minute. Once the water has cooled down a bit, pour it over your coffee grounds. Put the French press lid on and push the filter down. Let your beverage steep for a few minutes. If you are using a smaller French press, 2 or 3 minutes would be enough. For a larger French press, wait for around 4-5 minutes. While holding the lid, pour your freshly brewed coffee into a mug. Enjoy! If you love cappuccino or latte, you can make it at home too (even without a special milk frother). Simply pour some warm milk into your French press (a clean one, of course), put the lid on, and pump the filter plunger up and down for around 30 seconds. The milk will form a fluffy foam you can add to your coffee to make a delicious cappuccino or latte. Did you know that you actually don’t have to throw away the used coffee grounds? You can use them as a body scrub, a garden fertilizer, an odor neutralizer, and in many, many other scenarios. A French press can also be used for tea and the cold brew process (which I will describe below). By investing in some simple coffee equipment, you can do a couple of things. First, you will save a lot of money (since you don’t actually need to buy a coffee maker). Secondly, you will always have access to good coffee, even when not at your own home. And the good news is, there are many kinds of inexpensive coffee equipment. For instance, a simple Aeropress or (even simpler) French press can offer you a great quality cup of coffee every time. This method is ideal when you are an overnight guest, and everything your host’s kitchen has is either a saucepan or a kettle. The Cowboy method would also come in handy during camping, especially on a cool day when you need a hot and warming beverage. Interestingly enough, coffee tends to cool down much slower once you add cream to it. And if you add milk, it will weaken the effect of the caffeine in your beverage. Put your ground coffee into a pan or a kettle, whichever you have. Pour some water onto it (room-temperature or cold). Place the saucepan on the stove (or over the fire if you are camping) and bring the coffee mixture to a boil. Let it boil for around 2-3 minutes. If you are cooking on the stove, reduce the temperature a bit for an even simmer. Take the saucepan off the stove (or fire) and let it sit for 5 minutes. This way you will allow the grounds to sink down to the bottom of the pan. Slowly pour the brewed coffee into your mug (or use a ladle to carefully transfer the beverage to your cup). Try to keep the grounds at the bottom of the saucepan. However, if a couple of them get through, that’s okay. Your coffee will taste great anyway. This method is quite similar to the Turkish coffee recipe. However, for a Turkish coffee, you need a special pan called cezve. You need to put very finely ground coffee in it, fill your cezve with water, and bring the mixture to a boil. When brewing coffee using the saucepan method, keep in mind that some water will be left in the pan. You simply will not pour everything into your mug since you need to keep the coffee grounds away. So, add a bit more water than for just one cup of coffee. The regular ratio for this brewing method is 2 tablespoons of ground coffee to 6 ounces of water. However, don’t be afraid to experiment and try different ratio options. This way, you will find the perfect coffee-water combo for your desired beverage. For a bolder flavor, put a lid on your saucepan once the coffee starts to boil. This way, the beverage will steep more and will turn out to be full-bodied and even richer. a fridge or a cool place. Place some coarsely ground coffee into a container or a jar. Fill it with room-temperature water. The recommended ratio is 1 part coffee and 3 parts water. However, feel free to experiment to find your ideal beverage ratio. Tightly close the jar or the container using a nicely-fitting lid. Leave the mixture in the fridge for at least 12 hours to steep (overnight is also a good idea). Once your coffee has steeped, put a small sieve or a cheesecloth (or both) on top of your mug. Carefully pour the brewed coffee through the sieve. Dilute your cold brew concentrate with water. Note that this method results in a very strong beverage, so it’s better to add 1 or 2 parts of cold water to it. Add some ice and a creamer/sweetener of your choice. Bon appetit! You can make a large batch of coffee using this cold brew method and then store it in the fridge for up to 2 weeks. If you are a fan of iced coffee but hate the taste of a diluted beverage once the ice cubes start to melt, try something new. Freeze the coffee, which you can make beforehand, and then use those coffee cubes instead of ice. They will melt in your drink but keep it strong and flavorful. When shopping for coffee beans, keep in mind that there are two main types: Arabica and Robusta. Arabica is more flavorful, richer, more expensive, and has lower caffeine content. At the same time, Robusta is less acidic, less flavorful, and contains more caffeine while being a bit more bitter. Using tap water. It can simply alter the taste and the flavor of your beverage because of its chemical components and minerals. I know that bottled water is expensive, but you can probably invest in a water filter jug. This is an affordable option that will purify your water easily and fast. Buying pre-ground coffee. Pre-ground means “not fresh”. And when your coffee isn’t fresh, your beverage doesn’t taste good. Investing in a simple blade grinder is a great solution. However, if you want to go further, a burr grinder is even better! Neglecting the freshness of the coffee beans. If your coffee beans were roasted a long time ago, they aren’t very flavorful anymore. That’s why it’s important to pay your attention to the roast date on the packaging. Using dirty utensils and equipment. Just don’t do that. You know why. Storing your coffee beans in the wrong place. Remember: coffee doesn’t like light, heat, and humidity. So, keep it away from them. Use an airtight jar or container and store your coffee somewhere in a cupboard far from a heat source. And please, don’t keep your beans in the fridge or freezer. This will only make them lose their flavor.